AquaBounty Technologies in Maynard, Massachusetts, has said it's sold about 5 tons of genetically-modified (GM) salmon fillets to unnamed customers in Canada. These fish can reportedly grow twice as fast as conventionally-farmed Atlantic salmon, reaching adult size in some 18 months as compared to 30 months. AquaBounty has also claimed the salmon consume 20 to 25 percent less food per gram of new flesh. 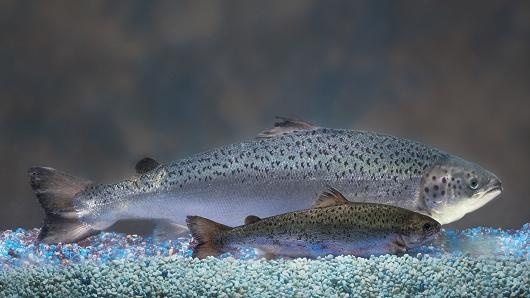 In 2015, AquaBounty salmon was approved in the U.S. by the Food and Drug Administration (FDA), it was reported to be the first genetically-modified animal to be approved for human consumption. But within weeks the FDA issued a ban on the import and sale of GM fish until labeling guidelines were established. The firm's Atlantic salmon are modified with a growth hormone gene from Chinook salmon that makes them grow much faster than normal.